From surgical airways to the undifferentiated shock patient, this week’s Grand Rounds was packed full of clinical pearls. Dr. Carleton started with a discussion of a tachycardia-inducing failed airway requiring cricothyrotomy. Drs. Jensen and Makinen presented a very detailed review of the literature and their proposed algorithm on infective endocarditis. Dr. Harty reviews a fascinating case of cecal volvulus that was identified early with the aid of a RUSH exam, while Dr. Liebman walked us through an approach to the patient with inhalation injuries. Finally, Dr. Roblee led an excellent review of SBP. The discussion was full of information you might use on your next shift! From epi drips to peds fracture tips, it was an eventful Grand Rounds. We began with a debate on the utility and method of epinephrine during cardiac arrest. Dr. Murphy then discussed hemodialysis access complications followed by Dr. Palmer’s operations update. Dr. Shah led a discussion on the recognition and management of pediatric fractures. We concluded by covering a variety of other pediatric topics during the R3 small group session. Take a look! This academic year’s penultimate Grand Rounds started with Guest Faculty Lecturer Dr. Richard Levitan lecturing on airway tips, tricks, and trouble shooting. Drs. Harrison, Sabedra, and Summers then led small group sessions focused on unique applications of ultrasound. Dr. Hughes discussed TB management in the ED and Dr. Thompson closed out Grand Rounds with pearls on patient management. This week Airway Guru Dr. Carleton walks through the perils of peri-intubation hemodynamic instability, and how we can use changes in pre-oxygenation and induction methods to reduce the chance of intubation M&M. Afterwards, Dr. Riddle covers terminology, dogma and how to care of our LGBT patients. Grand Rounds kicked off this week with Dr. Axelson's final M&M of the year where we learned about hypertensive emergencies, 2nd & 3rd trimester vaginal bleeding, the care of the sick asthmatic, which bronchiolitics can go home and how exactly to treat the many forms of UTIs. Drs. Kircher and Murphy-Crews continued the learning with a case follow-up about intubating patients with airway stents and pediatric head injury, respectively. Our joint EM-Peds lecture rounded out the day with visual diagnoses in peds. Thanksgiving is over, now it's now to relive Halloween. Take another airway lesson from Dr. Carleton and his IC Cordes course. This episode he takes us through a terrifying Air Care case through the lens of the Difficult Airway Algorithm in a case of a bloody airway courtesy of a bullet through the oropharynx. This week we had a special visit from Dr. Darren Braude from the University of New Mexico Department of Emergency Medicine to speak on special topics in airway management. He introduced us to the idea of Rapid Sequence Airway (RSA) and other novel thoughts on extraglottic devices. We then had a chance to dive in to our regularly scheduled program with topics ranging from tuberculosis to ED operations to complex febrile seizure. Enjoy! Welcome to the Fourth Case in our Air Care and Mobile Care Flight Orientation Curriculum for 2016! The UC Division of EMS has recorded a series of podcasts to celebrate EMS Week 2016. We are honored to be able to engage EMS Providers throughout the world with this forum. If you practice pre-hospital medicine, we would like to say thank you and that we appreciate everything you do to provide a high level of care to ill and injured patients in a wide variety of austere environments. 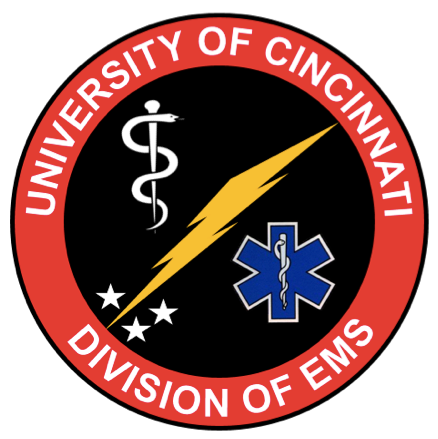 For this podcast, we were joined by Dr. Dustin Calhoun, Associate Director of the UC Division of EMS, as well as two of this year’s UC EMS Fellows, Dr. Mike Bohanske and Dr. Justin Benoit.